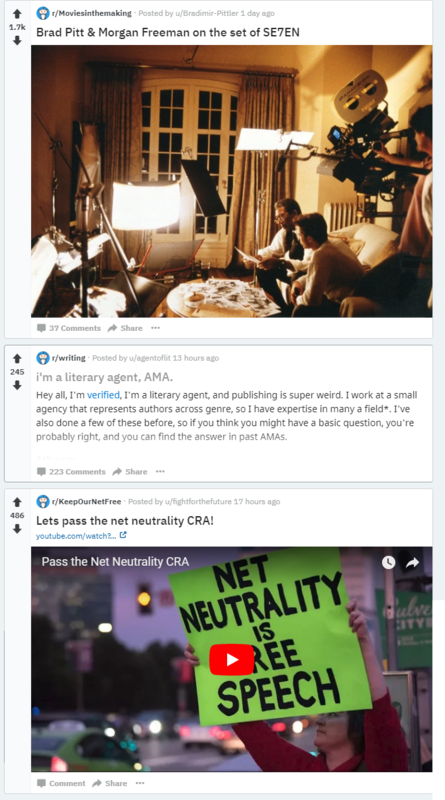 Reddit’s redesign prioritizes visual content over comment content. This devalues discussion-based subreddits and has a high likelihood of creating a poor user experience (UX) for people interested in this facet of Reddit. It limits exposure of discussion-based subreddits and risks diminishing their quality and/or contributions to Reddit at large. Thematically, our suggestions mainly focus on customization. This allows the redesign to continue as charted while making breathing room for discussion-based subreddits. The “comments” button should lead to a static page. There is currently no difference between clicking this button and clicking the title, rendering it useless. Option for mod teams to categorize their subreddits as “discussion-based”, and/or include a lightbox toggle for users. Customizable original poster (“OP”) icons. Rule widget that distinguishes between submission rules and comment rules. Big Editor, ability to save drafts, and other commenting/reading options. Some stylistic suggestions to improve readability of long discussions. In April 2018, the moderation teams of multiple discussion-based subreddits (collectively known as “Design for Discussion” – see cosignatories at the bottom) collaborated to address shared concerns regarding Reddit’s redesign. Specifically, the redesign appeared to prioritize content such as images, videos, and gifs over comments. Discussion subreddits view comments as their content, and therefore worry that their subreddit’s unique offerings will be devalued and under-exposed under the new design. We have shared these concerns in /r/redesign and in public blog posts. Offer concrete ideas for redesign consideration with an eye towards preserving and improving upon our experiences moderating discussion subreddits. 1. Lightbox customization and changes. The Lightbox is a “pop up” of a post to be viewed (or, in our case, read). Screenshot of the lightbox for this post in r/redesign. We understand the motivation behind this feature. As one admin pointed out: “we opted to use a lightbox for fast navigation through content, hitting the right and left arrows on lightbox for power users.” On the whole, we appreciate that faster loading is generally a UX improvement. First, it makes comment sections feel like secondary content. This may be an accurate prioritization for visual subreddits like r/pics, r/funny, etc., where comments are often tangential observations and stories, but the same cannot be said for subreddits with a focus on heavy discussion – comments are our content. Second, it suggests that content should be consumed quickly. This is true in many visual subreddits, which foster more casual browsing. It can also make sense on a user’s front page, where they might want to flick through the top posts of their favorite subreddits. But “power users” of discussion-based subreddits do not flick through content quickly. From our experience and conversations, we believe a click signals that users want to read through a specific discussion. Third, the narrowness of the lightbox is straining on the eyes when reading long discussions, and the transparent background on either side is a distraction. This should be an immersive experience. Users marinate in and consider the details of a post within its whole context. The lightbox, in contrast, creates the feeling of a preview. Taken together, this dramatically lowers the UX for discussion subreddits. Based on the above, the “comments” button should universally lead to a static page. It doesn’t make sense to have this as a separate button only to achieve the same result as clicking a title. a. Introduce a toggle that allows users to turn the lightbox on/off for themselves. This would allow users interested in the immersive experience to isolate their favorite discussion subreddits and opt into a comment-content UX. b. Allow moderators to designate their subreddit default as “discussion.” Introducing this option would show that the admins recognize the site’s multipurpose nature in the redesign. Currently, subreddits have no categorization of this kind. This opens a door to any discussion-specific possibilities in the future, but in the context of the lightbox it also provides an opportunity to solve the problems listed so far. One approach would be to allow moderators to entirely switch off the lightbox for their subreddit, giving complete control of how using it should feel. Another would be to coincide with the previous toggle suggestion, allowing moderators to decide whether users must opt-in or opt-out of the lightbox experience in their subreddit. 2. Expand margins of card view to increase visibility of self-posts. This is especially important in mixed media subs or on the Reddit homepage. When surrounded by media posts, the self-posts are of significantly smaller stature and are easily missed. Since many of our subreddits are self-post only (or dominant), this has a disproportionate impact on our sub exposure. Increasing the margins of the box would preserve some visibility for discussion subreddits. Example of this problem, provided by u/ZadocPaet. 3. Create separate widgets for submission and comment rules, with the ability to vary ordering options (e.g. Rules A–E, Rules 1–5, Rules I–V). Discussion subreddits often have specific rules for the conversation that takes place. The redesign currently just has one rule widget with ordering from 1–10. This makes differentiating between rule categories harder.2 Cross-platform, non-CSS options such as this are a major boon to discussion subreddits. On a related note, the Design for Discussion group can provide many use cases, upon request, where we have tried to remind users of rules, etc. using CSS modifications. Since these are typically circumvented via mobile browsing or turning off CSS, we would also appreciate the design team considering in-built methods of rule promotion. 4. Allow customizable OP icons. Currently, the redesign includes a microphone icon beside OP’s username. We like the idea of OP icons and many of us use them via CSS in our subreddit. However, the microphone, for our purposes, has an unfortunate connotation: it suggests a conversational imbalance, where the OP is on a “soap box,” i.e., the sole intent is to evangelize their perspective. Please allow us the option to change the icon, and thus preserve our balanced, conversational focus. Image taken from this CMV post. 5. Allow flair-based default thumbnail images. Discussion subreddits tend to be self-post only, so it can be very plain and repetitive to always see the same thumbnails. With CSS today, many discussion-based subreddits use flair to change the thumbnails to better showcase their meanings and keep them unique. 6. ‘Big Editor’ option for typing comments. This will allow for more high quality comments to be made. As an aside, any ability to maintain a draft of a comment for later use within the Big Editor would be welcome. Incorporation of “Save as Draft” into the mobile experience would likewise be excellent, as it allows users to digest information and respond in real time without feeling as though their response is limited to typing on a phone. 7. “Hide all child comments” button at the top. This will improve visibility of top-level comments, which is important for posts that ask questions. 8. Allow child comments to be collapsed without the parent comment itself collapsing. If the parent comment collapses, the whole page makes a slight jump upward, which is disorienting. 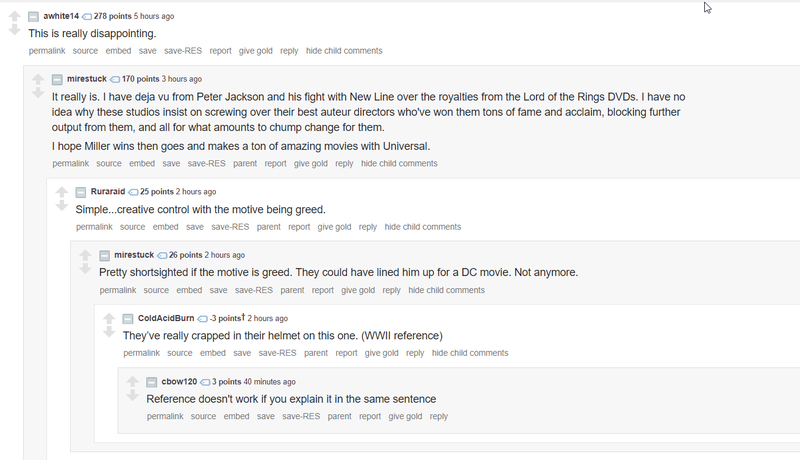 The pointer is relocated to the next comment’s upvote button every time, which makes the reopening of hidden comments inconvenient. Comment color alternation, provided by u/qtx (see reference 3). A second possibility is to add a lighter shade of grey for links underneath the comment to remove the focus on that section. Currently, one’s eyes focus on the links first instead of the actual comment. Likewise, the reply button, as the foundation of conversation, should stand out. One way to accomplish this is through a darker shade or an “alt color.” We want users to be able to reply as easily as they can thumb through image content. Another useful addition would be giving an option for subs to change the transparency of the lightbox. Today, the faded transparent background of the lightbox is distracting if the sub’s design is too colorful. Alternatively, provide the option to have a solid color as the background. Design creates the “rules of the road” for UX. Discussion subreddits strive to have an experience that prioritizes comment content. This is enabled in large part through clear rules, effective enforcement, and community norms centered around reading entire posts and comments. Design for Discussion feels that, based on our learned experience, the Reddit redesign tips the scales in favor of visual content over comments. Therefore, we collaborated on this proposal to turn our constructive feedback into useful solutions for the design team to consider. We appreciate all the thought and effort put into this redesign and look forward to discussing this further. ¹ Please note that nothing in this proposal should be construed as a demand or ultimatum. Our sole purpose is to share our concerns and, building on that, suggest experience-based solutions. ³ Suggestions by /u/qtx, who designed the CSS for /r/AskReddit, /r/ChangeMyView and /r/IAmA, to name just a few subreddits. /r/IAmA (17,889,254 subscribers) is not party to this proposal; however, they present a good use case of Reddit tailoring its design to the specific function of a subreddit, therefore supporting the intended UX and bolstering its broad appeal. We find /u/qtx’s feedback persuasive in this context.